My thoughts and actions control the flow of success, positivity and abundance into my life. It’s March and the St. Patrick’s Day decorations serve as constant reminders of luck and good fortune. This month begs the question are some just born lucky, or can we actually control our own luck? The good news is, our actions contribute significantly to what we attract into our lives. The law of attraction supports the notion that positive thinking often leads to favorable results. Although as legal professionals, our minds are trained to predict all reasonable outcomes, it takes just as much energy to envision a situation succeeding as it does to visualize it ending in failure. Additionally, when faced with less than ideal situations we cannot control, we still maintain control over our reaction, which can significantly improving the outcome. Several months ago, the head of my division along with key personnel were conducting a site visit of my office. As part of the visit, my colleagues and I were responsible for providing a presentation complete with PowerPoint slides and a short video. My office arrived at the presentation space ten minutes before it was to begin. We planned this visit for several weeks and expected to walk into a room that was arranged theater style with the PowerPoint slides projected on one screen and the video presentation projected on another. Expectation and reality are often two different things. When we walked in, the room was arranged for an employee awards breakfast. Additionally, the PowerPoint would not project onto the screen and although the video was visible, the audio was playing the theme song from The Price is Right and could not be silenced. I still have yet to figure that one out. I wanted to lose it, but I stopped and asked myself how that response would be helpful. Surprisingly, my reaction immediately changed from one of panic to calm, allowing me to focus on what I could control. With the few minutes remaining before the arrival, I took off my jacket and began moving tables and chairs so the room was configured properly. One of my colleagues worked with our IT contact and asked him if he could at least turn off the volume to the video. After our IT contact went to the audiovisual room to address the volume, he was able to adjust with the projector controls, making the PowerPoint visible and with mere seconds to spare, the video audible with no theme song interference. When our division head and his staff arrived, we appeared calm and prepared. Positive thinking has the ability to manifest favorable outcomes, in essence creating our own luck. When we adjust our reaction, we also have the power to infuse positive energy into situations where we lack control. Use a failed project, idea or assignment as an opportunity to control your reaction. Change your focus from what is not working to what can work and observe how the energy shifts for the better. Additionally, when faced with a challenging assignment, explore all reasonable scenarios, yet envision the final result as a success. Revisit a physical goal that has eluded you. Whether it’s taking ten thousand steps a day, packing a healthy lunch or maintaining a fitness routine with a demanding schedule. Instead of feeling guilty about not reaching the goal, shift your thoughts towards the small steps you can take to move you closer and picture yourself ultimately reaching the goal. 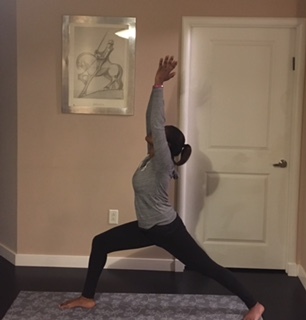 Warrior I (Virabhadrasana I): This standing posture with reinforce your ability to remain positive, calm and strong in the midst of negativity or chaos. Stand tall, lunge with your right leg to a 90 degree bend and extend your left leg behind you with your left foot at a 45 to 60 degree angle. Raise your arms above your head and look up. Hold for three deep breaths and repeat on the opposite side.